This project uses a 16 oz yogurt tub, some cardboard, felt and green glitter. It always bothers me to throw away plastic containers that seem to have been designed to last forever. Fortunately, there are ways to turn them into useful objects (see for example this sewing kit) or fun party decorations, like this Leprechaun Hat for St Patrick's Day. 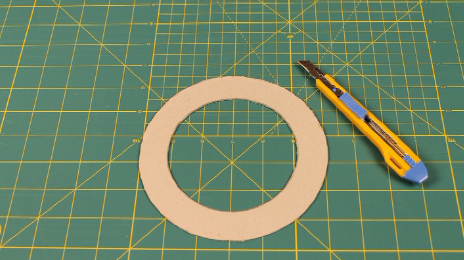 Cut the rim of the hat from thick cardboard. The inner circle should be just big enough to fit over the yogurt container. 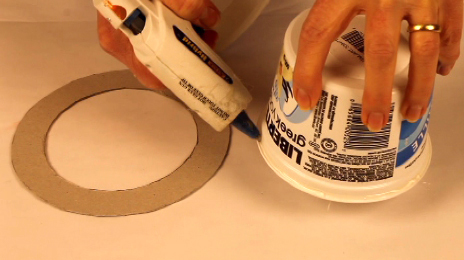 Glue the rim of the hat in place with a glue gun. Slide the rim over the plastic container. 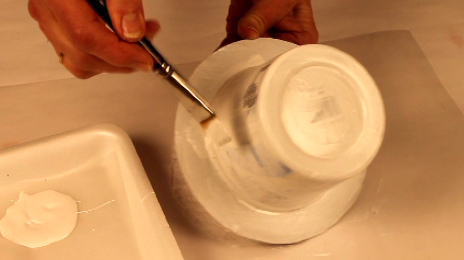 Paint the plastic container with white acrylic paint to cover all the text and pictures. 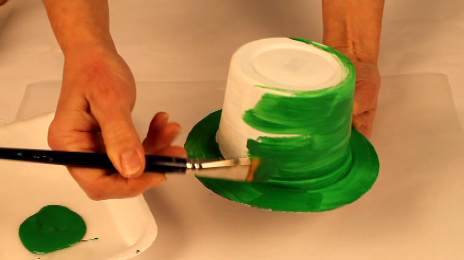 When the white paint is dry, paint the plastic container and the rim green. Paint both sides of the rim. Prepare a mixture of water and white glue. 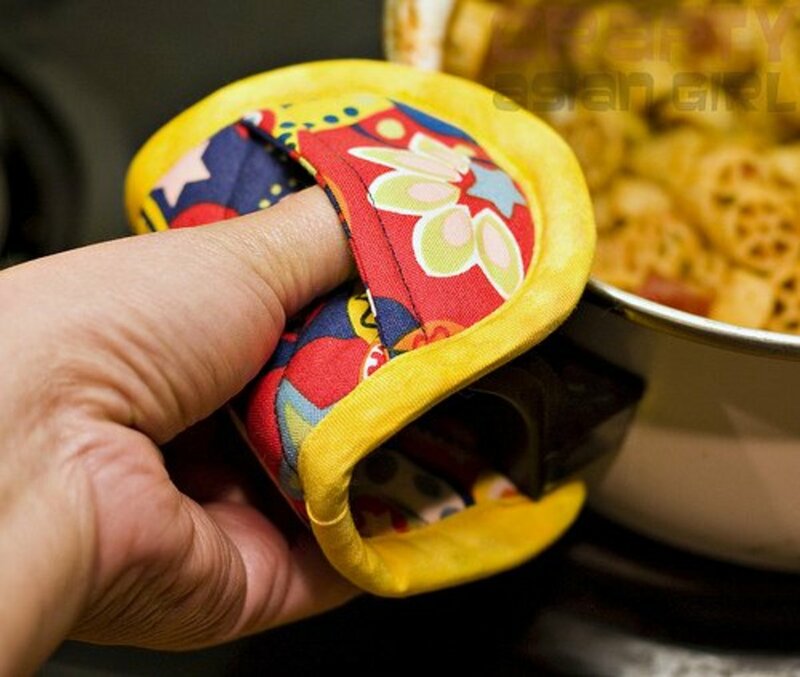 Brush the hat with the mixture. 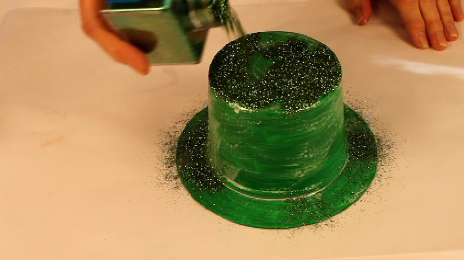 Then pour glitter over the hat and let the glue dry completely so the glitter stays on better. 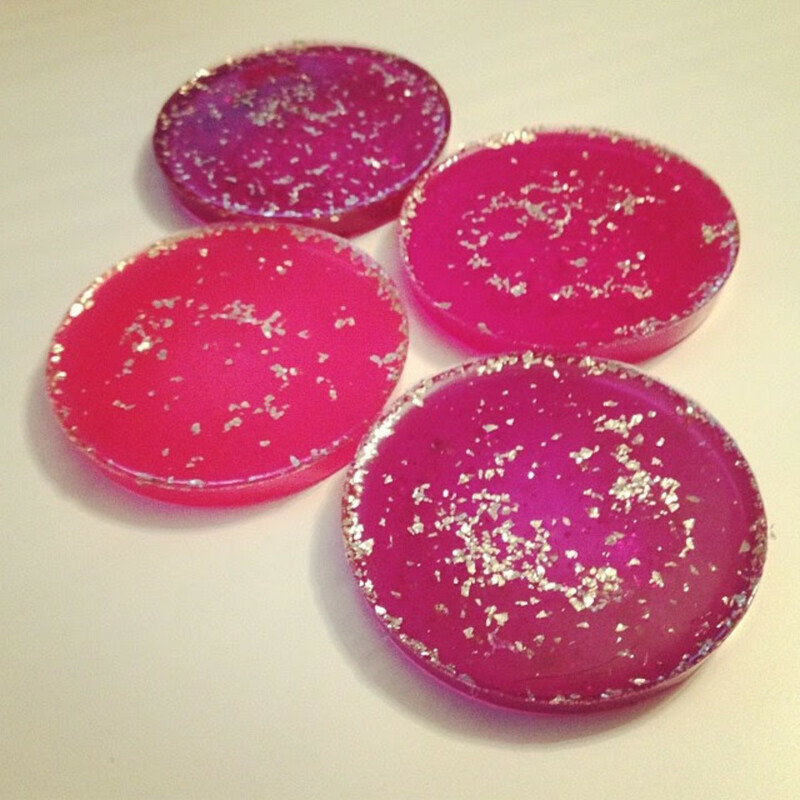 Also brush the other side of the rim with the mixture and pour glitter on it. Cut a buckle from construction paper. Paint the buckle in gold. Cut a 2 cm (¾ in) wide and 36 cm (14 in) long strip of black felt. Pass the felt ribbon through the buckle and glue it around the base of the hat. God bless you! Have a nice day! Very nice when are you making my hat for me? :) . By chance is that you in the you-tube instructions video? Thank you Crafty :-) You are very kind! I just like to create... especially in 3D :-) Have a great weekend! Seriously, how do you come up with these awesome ideas! I love this. My daughter eats a lot of yogurt, and now I have a reason to save the empty containers. I could totally bring this to the younger grade teachers as an art project. It's true! I feel very blessed myself. kidscrafts You are so busy.I am glad you get to do so many things.Thanx to you for sharing and congratulations to you both for working as one great team.I know I couldn't do half of what I do if it wasn't for my wife giving me some extra free time and all her love and support.We both are so so blessed. Thank you so much for taking the time to write a so long comment Dream-On! It's very kind of you! In fact, I don't really have time to prepare some kits and things like that because I am always busy preparing another project.... and sometimes I give workshops. I try to do one video per week with a new project and I don't have time to put them all on hubpages. 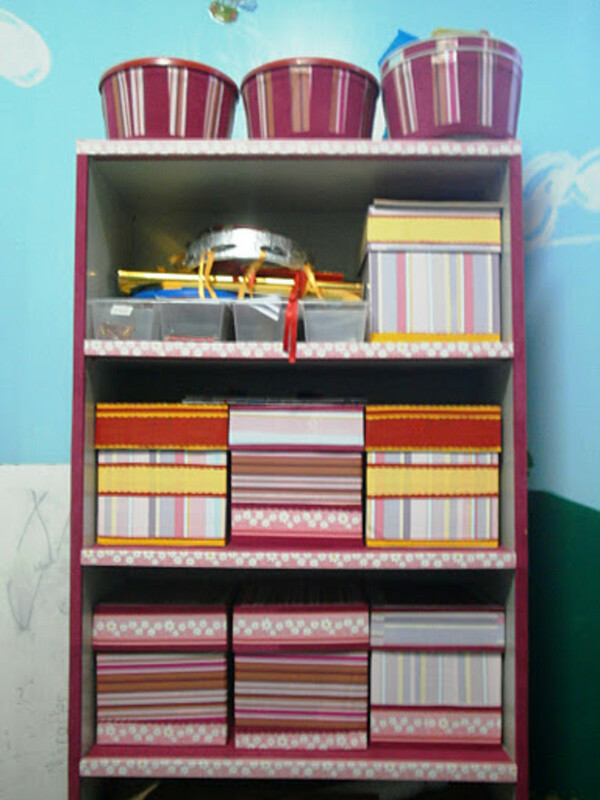 And I work also a lot creating 3D projects with paper plates and I write documents for my website. And I do everything always in two languages.... so it takes more time as well! More recently, I had 8 days in the same museum, creating robots... again, my husband brought me all kind of things to glue on those robots.... even pieces of sprinklers. I thought I was the only person who didn't want to throw out those plastic tubs for butter and thought if they could only be used for something.You made my day.I have a new thought that maybe you would like.If you put three or five of your arts and crafts projects together in a folder and had a sample of all the material you needed for each project in separate bags showing others what they need and one finished product what they look like.You could sell them to nursing homes or kindergardens as starter kits and even supply more materials for a reasonable price.Making a small profit and helping others get their ideas off the ground.Even mothers would love a quick easy to do.Ready to get started project that could bring you some extra cash and make your hubs even more valuable by spreading the word.Everyone is so busy they read your hubs and then no time forget to get the things they need.I just love creative people and all the things you can do.I am prouid to say you make arts and crafts fun to do every day. Thank you FlourishAnyway! I think it's nice when babysitters prepare special activities for the kids they take care of and I am sure that the parents appreciate that even more. I keep the kids busy with interesting projects, using their hands instead of watching TV. My kids were really into legos.... and still are as adults :-) I remember one time that we had a babysitter, my eldest son told the babysitter that it was time for him and his brother to go to sleep (for which the babysitter was quite surprised) and then my son gave him an lego assignment to build something for the next day while they were going to sleep. The babysitter found that quite funny. I don't remember if he did the assignment or not! Very cute! Great little idea for the kiddies to make and enjoy. Keep the wonderful projects coming. They make a good source of entertainment for babysitters who want to do something special with the kids. I used to do small arts and crafts projects with kids I babysat when I was a teen, and the kids and parents really appreciated the extra effort. Now that my daughter is a teenager, I am trying to show her a few of these little ideas. I used to really struggle sometimes to come up with ideas, but thanks to the Internet -- and Hubbers like you -- it's easier these days! What a great craft. I am in charge of our schools Craft Club. This will be great for them to make next year for St. Patrick's Day. Up, useful and interesting. Thank you for your kind comments DDE! Until I came to Canada, I didn't know about St-Patrick's day. There are a lot of people from Irish descent in Canada. So I thought it would be nice to create something for that! 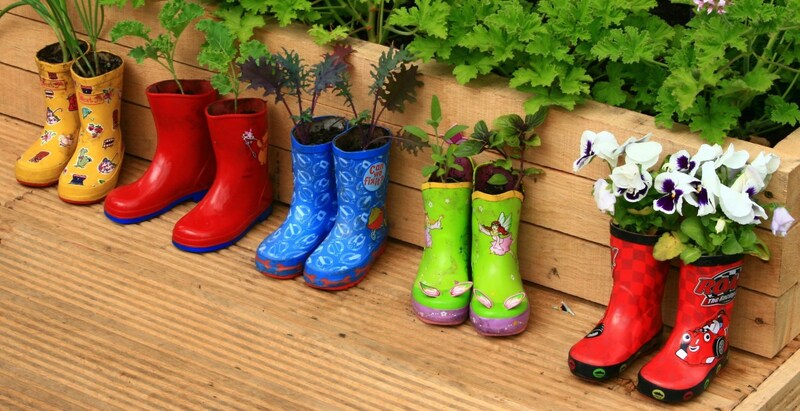 Awesome kidscrafts you always have such great ideas and with a creative mind you can do anything with something small. Thank you for your visit Michelle! Enjoy your weekend! Coming in again to say that this is a fun way to recycle! Thanks for sharing, Kidscrafts, and I share as well. You write and create.... I draw and create ... mainly for kids, parents and teachers... just to help them to think further mainly in the 3D thinking! It help kids also to have fun while learning! great... hub.. thank you .. Thank you very much for your kind words Eddy! I hope you will have great fun creating hats with your grandkids! What a brilliant hub and all ready for when the grandkids come to stay. Coming in again to say this is a great idea and sharing! It's more like a decorative hat....just for fun! And you can "hide" a treasure in it. But you could do the equivalent with a 2 litre container of ice cream and make a wider circle . That would work too! This is just in time for St. Paddy's Day, so I'll try this out. But it might be hard to find a yogurt container that's wide enough to fit over my big head ;) Voting this Up and Useful. Hi Michelle! Thank you for your visit! As you can see on the video, you don't have to make the hat green. 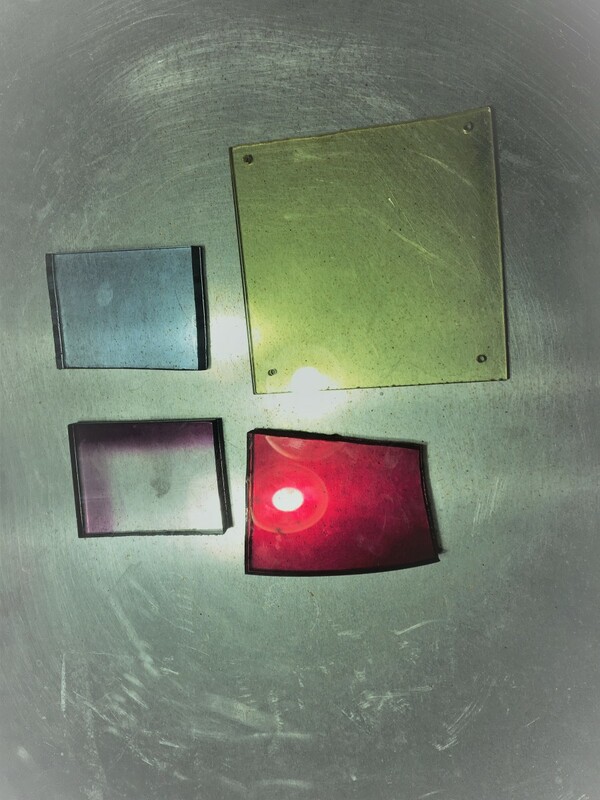 You can do it in any colour and decorate as you wish! I hope that you will have fun doing this activity with them! Have a great day! Wow, something great for kids to do, and I will be trying this with my two twin nieces. Thanks for sharing! What a fabulous idea. I am part of a co-operative playgroup where we take turns making the crafts with the children, this will be such a hit with them. You have the very best craft hubs for kids! Thank you very much for your visit! Indeed, as soon as you have the basic shape, all the decoration on the hat is only limited by the imagination! Just go for it and have fun! This is really creative. Plus it's a great way to reuse stuff at home. Once we get the basic shape, it's all up to the child's imagination. voted up!